Our version of this traditional frozen Italian dessert is flavoured with vanilla, almond and chopped cookies. It's quick with only 10 minutes of prep time! Beat pudding mix, half-and-half and extract in large bowl with whisk 2 min. Stir in Cool Whip. Spoon into 8 dessert dishes or paper-lined muffin cups; top with cookies. Prepare as directed, substituting Jell-O Pistachio Instant Pudding for the vanilla pudding and Nilla Vanilla Wafers for the Oreo Cookies. 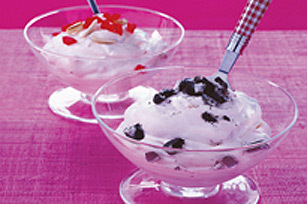 Garnish each serving with a dollop of thawed Cool Whip Topping and additional chopped wafers, if desired. Substitute 1/2 cup chopped toasted slivered almonds for the Oreo Cookies. Save 60 calories and 3 grams of total fat per serving by preparing with Jell-O Vanilla Fat Free Instant Pudding, Cool Whip Light Whipped Topping and Reduced Fat Oreo Cookies.